I finally had the guts to disassemble my avx, clean it, regrease it and replace it's bearings with new better ones. One of the bearings I've changed is the radial bearing; i replaced it with a tapered one just like RocketSparrow did here . 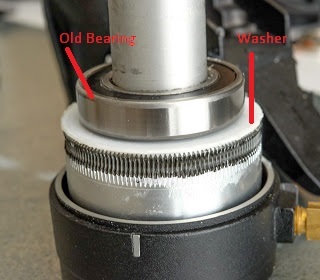 1- If I use the washer, I can hear a sound like something's rubbing on something while slewing the mount although i did experiment with both very little grease and a more generous amount of good quality grease on the washer. 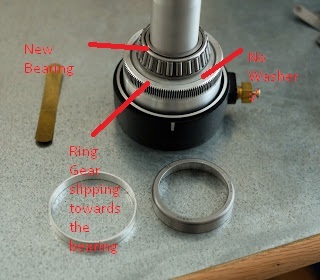 2- If I remove the washer, the axis becomes extremely smooth and exactly what you'd expect from a hypertune and the rubbing sound disappears; however, the ring gear starts to slip downwards (towards the bearing). So it seems to me that the washer is holding the ring gear and keeping it from slipping downwards. I've attached some images to clear this further. The images used are from RocketSparrow's website with added markings from myself. Can anyone with some experience in Hypertuning the AVX care to clear this thing up for me? should i use the washer or not? Is it fine if the ring gear slips downwards? What can i do to stop the ring gear from slipping while getting that smooth motion I got without using the washer. Edited by Astrohoven, 11 February 2019 - 06:55 AM. I came across the same issue the first time I preformed this to my AVX mount. I would throw that white nylon washer out because that will only cause more space in the RA. After a couple of different versions i found a 3D printed set of washers that works well. You have to put a spacer under the ring gear as well as one on the top of it. I forget the exact dimensions but the top washer should be 1mm thick. The inner diamter should be wide enough so that the tapered bearing does not sit on it. The outer diameter should be small enough that it does not extend past the ring gear. The bottom washer should be the same inner and outer diameter as the plastic washer that is already in there. Plus be about 1mm in thickness. This bottom washer should be the first piece that goes back in housing, then the plastic washer, then the ring gear. This will align the ring gear to the worm gear as well as get rid of the play. Thank you Brother for the clarification. You lost me a bit with this "This bottom washer should be the first piece that goes back in housing, then the plastic washer, then the ring gear.". Which one is the bottom washer in your reference. Do you mind sending me a pm with a bit more info. Can we discuss it there? I think that would be major help.